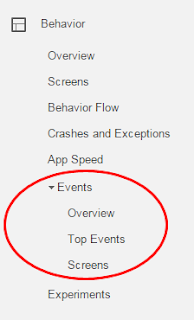 Over the summer, we enabled a feature in Google Analytics for your mobile app called “Events”. This feature gives you the ability to track when a user taps certain buttons. Tapping these particular buttons does not result in a new screen view within the app. Instead, they lead to an external action. Note: To clarify, these are NOT events like concerts, shows, or other performances. They’re user behaviors taking place within your app. To avoid confusion, we will refer to these behavioral instances as “Tap Events”. Get Tickets: When the user taps on the “Get Tickets Online” button to open an external ticket purchasing site. Phone: When the “Call Box Office” button is tapped to automatically dial the number. Map: When the venue address button is tapped to display the location of the venue on a map and get directions. Program Notes: When the “View Program Notes” button is tapped displaying a PDF of the program (this button only displays if a PDF has been uploaded within the event’s details). The most valuable piece of information here is how much traffic your “Get Tickets Online” button is receiving, which lets you get an idea of how much your audience is using the App to purchase tickets to your events. You will want to track this data after Push Notifications are sent letting your audience know that tickets are available for sale, when there is a special promotion, or on the days leading up to a specific event. To view this data, click on the “Screens” section under the “Events” menu. Each Screen Name corresponds to a different performance. 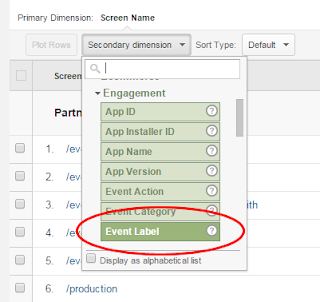 You can then click on the “Secondary dimension” menu, go to “Engagement”, and select the “Event Label” option. This will further break out the results by the different Tap Events and you can see how many times the “Get Tickets Online” button or the other previously mentioned buttons were tapped. If you’d like to focus on a specific concert or show, just click on the corresponding screen name, then “Event”, and “tap”. Now you will see a list of all Tap Events that took place for that performance. Don’t forget that you can also change the date range in Google Analytics. The default is for the past month. You may want to adjust this to see the Tap Event activity for a specific two-day period, the last two weeks, your entire season, etc. To refresh your memory on some other tips and tricks, read our post Google Analytics: Understanding Your Mobile Audience. If you haven’t set up Google Analytics yet, create a Property ID and get started!